The essays in this book, written over a span of some twenty years but updated for this publication, discuss episodes of mass murder that are often considered instances of genocide: the large-scale killing of Armenians in Ottoman Turkey during World War I, the near-extinction of North America’s Indian population, the vicious persecution of the “Roma” or Gypsies under the Nazi regime. But in line with Article II of the Genocide Convention of 1948, Lewy stresses the crucial importance of looking closely at the intent of the perpetrators. In contrast to the Holocaust, the killers in the atrocities mentioned above did not seek to destroy an entire people, and so, these three large-scale killings do not deserve the label of genocide. Lewy argues that affirming the distinctiveness of the Holocaust does not deny, downgrade, or trivialize the suffering of other people. The crimes against the Ottoman Armenians, the American Indians, and the Gypsies—even if they did not reach the threshold of genocide—involved horrendous suffering and a massive loss of life. The genocides of Cambodia and Rwanda that took place in the second half of the twentieth century remind us that man’s inhumanity to man can take many forms and is not the special prerogative of any particular group. 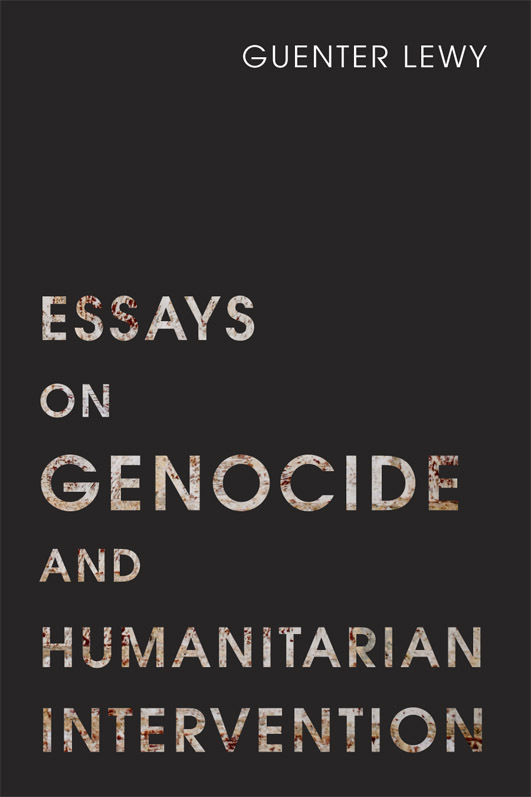 The last essay of the collection deals with the complications of humanitarian intervention to prevent genocide. As the recent support of the Libyan rebels by NATO demonstrates, the issues raised here remain topical and controversial. Guenter Lewy is Professor Emeritus of Political Science at the University of Massachusetts Amherst. His books include The Catholic Church and Nazi Germany; The Nazi Persecution of the Gypsies; and The Armenian Massacres in Ottoman Turkey: A Disputed Genocide (The University of Utah Press, 2005). 2. Can There Be Genocide without the Intent to Commit Genocide? 5. Did the United States Commit Genocide against the Indians? 6. The First Genocide of the Twentieth Century?